My name is Amy Barnes and I am a Realtor® and social entrepreneur. But, ahead of these things, I am most importantly a mom. This project is dedicated to my daughter Mia, and this page was created to tell why I have chosen to spend time on a piece of my past. My hope is that it will inspire others to do the same. Starting with a definition and disclaimer: The concept behind this preservation project is called Universal Design, also known as Inclusive Design or Design For All. If you are not familiar with the term: "Universal Design is a process that enables and empowers a diverse population by improving human performance, health, wellness and social participation." -Edward Steinfeld and Jordana L. Maisel (Authors of the textbook Universal Design, Creating Inclusive Environments). It has been nearly 4 years since I started physically working on 309 Elm, more than that counting the time spent cleaning it when I had it listed for sale. But for all intents, purposes and wholeheartedness, it has been since May of 2014 when my fiancé, Tom Stewart, bought it from the family of Lucianna Gladney Ross so I could make it into what it needs to be to help convey the importance of universal design and making sure things are designed to be used by all. Since then, this building has taken a lot out of me...definitely my blood and on more than one occasion too. And as disgusting as it sounds much of my sweat--especially in the summer with no air conditioning. And I would be lying if I didn't admit to having cried enough tears over this place to justify a levee. But as hard as all those things were to bear at the time, what’s interesting is that I would do it all again without hesitation, because it has given back to me the reality that, if you visualize something--no matter how wild or crazy it seems YOU CAN AND NEED to make it happen because it is the fulfillment of a dream….. and dreams are what keep the world moving forward. 309 Elm Street is listed as a ‘contributing resource’ to the town of Kimmswick, Missouri in the National Register of Historic Places. My siblings and I attended St Joseph Catholic School in Kimmswick and the town was part of our lives because our family lived on Montebello Road. My earliest recollection of visiting 309 Elm Street is when it was a Christmas shop in the early 80's. It is not a big place but it is quaint and cozy and I loved it then and still do. It was built in 1865 and was home to an immigrant named Bernard Klein, a St. Louis saloon keeper who may have also had a saloon directly across the street from 309 Elm, according to records in the Kimmswick Historical Society. For many years after Mr. Klein's ownership it was also home to some of the Arnold family, whose ancestors founded the town of Arnold, MO. For that reason many people know the building as Arnold House. To show respect to both former owners the building now bears signs remembering each. A few years ago, I had the opportunity to speak with one of its former residents, the late Ralph Davis, who told me he and his wife lived in the house the first couple years they were married, somewhere around 1950. Mrs. Davis baked cakes and sold them out of her kitchen. According to Mr. Davis, they did not live there long because the house was so cold in the winter and his wife wanted more modern conveniences. More recently, a former neighbor told me he remembers the building was briefly a Porter Paints store, which definitely explains the metal Porter Paints sign fixed to the wall along the steps leading to the cellar. Actually, we used Porter Paints to paint the shed on the property when we first purchased it and still have some of the iconic striped cans leftover so they too will stay here as a nod to that owner. Needless to say, it is awesome to have that permanent reminder of life lived here because it really does add to its colorful history. I can only hope that as history continues to happen as each moment passes, someone will be talking about the things we do here someday too. 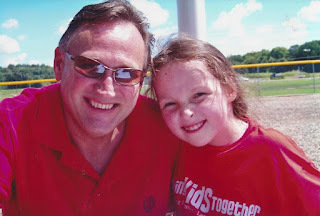 The history behind my participation in this story began in the mid 90's when life took me to Florida where I eventually met someone who would forever change my world for the better and that person is Mia, my only child and the love of my life. 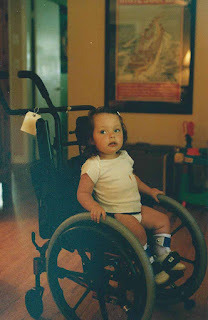 Mia was born with a spinal cord injury known as spina bifida and as a result, she has little to no feeling below her knees and uses canes, a walker, and wheelchair to navigate her life. She also has internal issues that affect her body's ability to do things on its own and spends a good amount of time and energy every day dealing with these circumstances in order to stay healthy. Today, at sixteen years old, she has had 14 surgeries, and as irrelevant as all this may seem to a rehab project, it makes up the huge ‘WHY’ behind my entire project. Each of these experiences has raised our awareness as a family that very simple changes can be made in construction projects that make life easier to live for a person with mobility limitations, adding to their quality of life and allowing them to be the best they can be. The path that led me to find out about Universal Design began when Mia was a baby. As a young mom, I needed to be able to work according to my own schedule so I could care for her. Selling real estate seemed like a good way to go because I love looking at houses and liked the flexibility being an independent contractor would allow. In September of 2002, I moved back to MO and we lived with my parents in our family home on Montebello. Real estate turned out to be a very demanding job but with the help of my family and friends, I did it and honestly could not have done it without them. I am glad I did too, because it opened my eyes about a lot of things that need to be changed. As did I, Mia too, spent her early school years in Kimmswick. 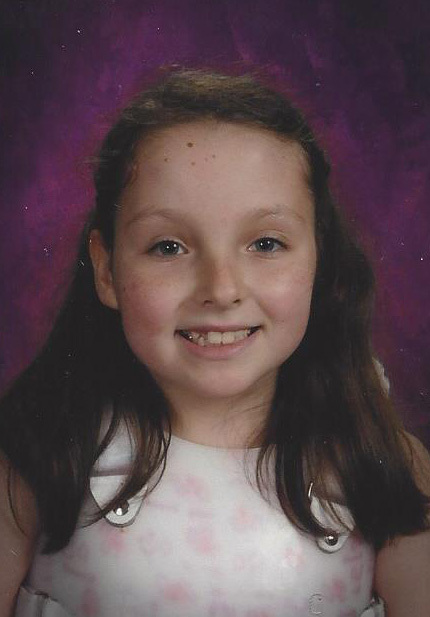 From Kindergarten to 2nd grade, she attended Windsor Elementary, the school that now occupies the land and space that used to be St. Joseph; in fact, her kindergarten was in the very same room as my 5th grade. 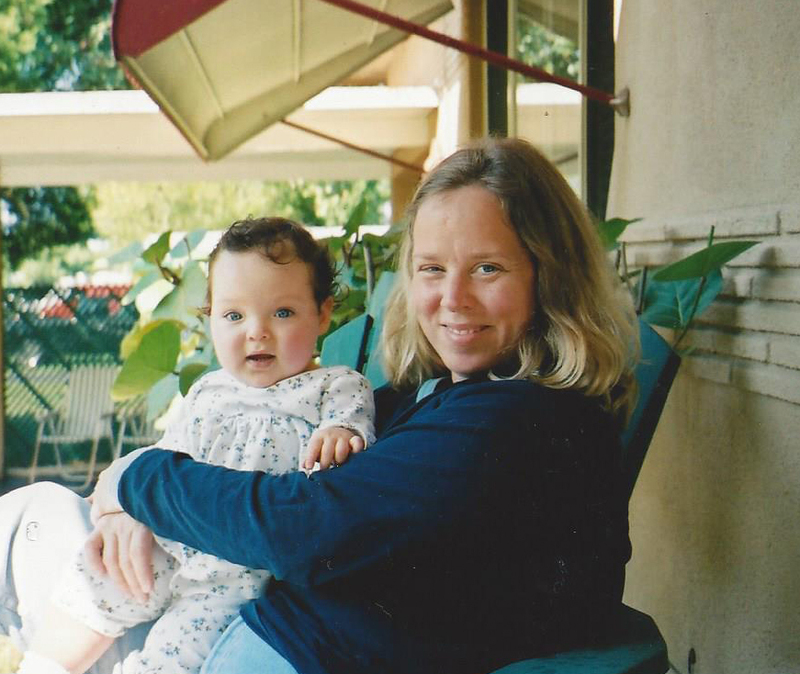 As she grew, and with each surgery and subsequent recovery period, it became vividly clear how much easier life would be for her--and my family and me as her caregivers--if things were built differently. This awareness crossed over into my work as I noticed there were few to no options in the housing market matching the needs people have for more accessibility in their lives. As a frustrated mom wanting an easier life for my daughter and family, I spoke often about this lack of real estate inventory with my friend and real estate Broker, Larry Palmer, saying we had to find a solution to this problem. Thus began the quest that led me to do this project and ironically, coincidences started happening all around me. Tom Stewart came into my life in 2009 at a very difficult time in my family. He embraced me and Mia and all of our quirks with his zest for life, undying support and faith in all things good. Tom is a one of a kind person that goes out of his way to help people and I've never met anyone quite like him. His favorite saying to me is "Spread your wings and fly!" and I do and am thankful for every day that I can. In 2010, as our real estate office was in a transition period switching brands. Our broker Larry took a poll on what real estate company we should align with among several he was considering and I voted for Real Living, reasoning the name aligned with the direction real estate needed to be going: focusing on accommodating the needs of REAL people because that is what being a good real estate agency does. Real Living Gateway Real Estate is what we are to this day. In 2012, I was invited to take part in an advocacy training program called Partners in Policymaking. It was there I learned about the brilliant but simple concept I had been seeking all along: Universal Design, where thoughtful planning meets function AND aesthetics. Time well spent. Please check into it. Studying Universal Design day and night through the University of Buffalo's IDeA program (Inclusive Design and Environmental Access) and taking pictures of great examples where ever I went to use them as support for my crusade to change the world--starting with Mia's--I immersed myself in their online program, enjoying the shared learning experiences with people from around the globe. In November 2014 upon receiving my completion certificate from IDeA, the instructor informed me I was the first person to complete all the courses in the program. This made me happy and sad at the same time: happy because I was the first to finish them all, but sad because there weren't more people seeking this type of knowledge. It is a proven fact that when more people employ the concept of universal design, the world will function more effectively and economically and the lives of millions, if not billions, of people will be dramatically improved. In 2014, Tom purchased 309 Elm allowing me to put what I have learned into practice. Having the chance to share my real and virtual experiences, in the town where I grew up and with one of my favorite buildings from childhood, really is a dream come true. The building was owned by the late Lucianna Gladney Ross, an historical preservationist and artist among many other things. Spending much of her life at a nearby farm, Mrs. Ross loved Kimmswick and was responsible for the town's revival with her efforts in restoring architectural treasures. In 2010, I was called to help sell her Kimmswick properties and it was in that capacity that I got to know and spend time with her. Sadly, she passed away in January of 2012 but I know Arnold House was her favorite. It has been through our ongoing real estate activities that I've become friends with her daughter's Helen and Lucy, who have been very generous in sharing treasures from their family's life. 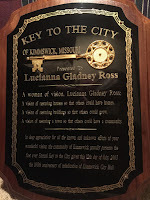 While going through some of her mom's belongings, Helen asked me if I would like the plaque given to her mom with the Key to the City of Kimmswick. As odd as I felt being presented with such a personal artifact, I accepted it because of the inscription on it and how it relates to what I am doing. 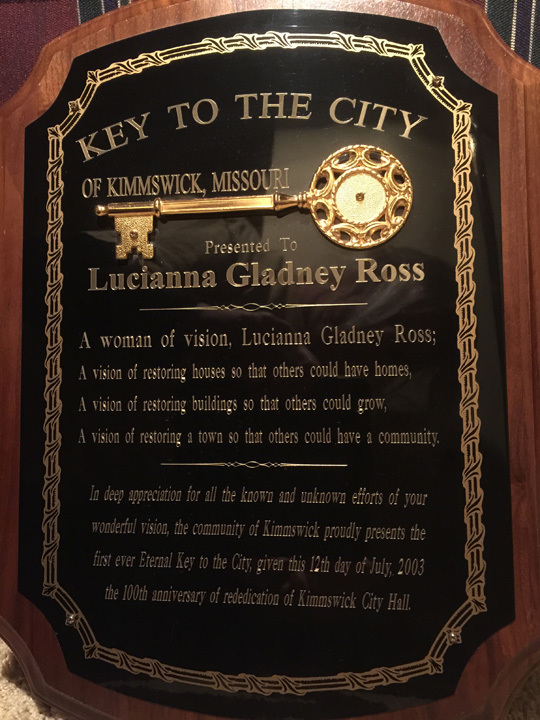 The honor that came with this Key remains that of the now late Lucianna Gladney Ross, the value to me is in the words and how they mirror my intent to change the way people develop property. The plaque will be displayed as a reminder to everyone that sees it, that all property--whether built new or reconstructed--should accommodate all the people who might use it and not just the ones who can walk in on their own two feet. Helen and Lucy say their mom would be very pleased with Arnold House. Lucy says I'm following my right livelihood. Looking up the term, it's the truth. This is what I am supposed to be doing with my time. This isn't an I project though, it's a WE project. I wouldn't be doing it without Tom, who made it possible in the first place. And neither of us would be doing it without Mia, the cause that led to the effect. WE are doing it together. Now, almost three years later, we are ready to show off the inside. Influenced by a lifetime spent visiting an antique clubhouse that my mom's side of the family shares, it's a rustic gallery of sorts and furnished with items collected from my real estate travels and life in general. As my first official universal design project, it is the headquarters of our social enterprise, providing us a legitimate base from which to expand our current portfolio of related projects--all focused on social change through the arts, culture and active living. All of these projects stemmed from our first project, Helping Kids Together, which was started when Mia was in elementary school as a way to bridge social gaps between kids with and without disabilities. Marketed as 309 elm, Arnold House provides a unique stage for us to produce pop-up events in addition to being offered for rent to groups for private events and meetings. All of these uses will provide revenue streams to keep the preservation of Arnold House going forward while helping us raise awareness of the importance of inclusion through our business activities and ultimately, help kids together. In totality the rehab of Arnold House is not yet finished because now that the inside is ready, we need to tackle Phase II. Being able to move about freely on the inside of a building is useless if people can't get in or out of it safely and with dignity. Phase II encompasses the hard and landscaping portions of the property as well as other improvements that will allow us to expand our range of services offered to the public. I created the piece below to help those who assist with Phase II understand my plans for this property and see the issues that need to be corrected in the process of making the improvements. Another disclaimer: I'm not a graphic designer, this drawing was created using Adobe Illustrator, which I learned how to operate through trial and error. It took me years to figure out the tools and I still don't know how to use them all and am by no means a pro. I am also not a professional rehabber, I went into this project with one prior rehabbing experience which was a shotgun home from 1895 that I worked on in tandem with other contractors, intentionally saving replaced elements of that property to use on this one so they could be repurposed historically accurate. What I am, is a person who likes to do things the hard way when learning, because I learn best by doing. I am being honest in stating it is not always a fun way to go because I have cried MANY tears of frustration and felt like giving up more than I care to admit. For this project at Elm, I hired contractors to do the major construction and plumbing jobs but have had help from friends, neighbors and relatives on many occasions, people who donated their time and energy just to see it succeed. My Uncle John, an electrician, did the electrical work and makes himself available anytime I ask for help. Tom, in addition to funding the project, is building storm windows and doors on top of helping with finishing details and general upkeep. Mia works on demo, cleanup, finishing projects. photography and planning and I am down to a few shirts and two pair of pants that aren't trashed from all my learning experiences. All these experiences are priceless because now Mia and I can say we've left something of ourselves in the place we both grew up as kids and 309 Elm is the community project I envisioned it to become: people working together to bring it to life. This makes it a success on it's own so hopefully others, upon reading this story and visiting us at this unique little property, will want to join in the fun and help keep the dream alive too.